Roddy Bottum, merican singerand keyboard player (Faith NoMore and Imperial Teen) was born 1 July 1963. Faith No More hail from San Francisco, California, and were regarded as one of the most influential metal/rock bands of the late 80s and early 90s, and credited for inventing alternative metal and as an influence on nu metal. The band was formed originally as Faith No Man in 1981 by bassist Billy Gould, keyboardist Wade Worthington, vocalist M Morris, and drummer Mike Bordin.A year later when Worthington was replaced by keyboardist Roddy Bottum, who along with Gould and Bordin, formed Faith No More. After going through a series of singers which included Courtney Love, the band was joined by Chuck Mosley in 1983. The same year, Jim Martin was recruited to replace guitarist Mark Bowen. Faith No More underwent several line-up changes before releasing their first album, We Care a Lot, in 1985. Within a year the band signed up withSlash Records, and in 1987 their second album Introduce Yourself was released. Membership remained stable until vocalist Mosley was replaced by Mike Patton in 1988. In 1989, the band released their highly successful album, The Real Thing, which featured the songs“Epic, Falling To Pieces, From Out of Nowhere and Small Victory. The band’s next album, 1992′s Angel Dust, was also highly successful and spawned the hit Midlife Crisis, , which became their sole #1 hit on the Modern Rock Tracks chart in their career. The next album Angel Dust is widely considered to be one of the most influential albums of the 90′s. Faith No More however declined in popularity in the subsequent years. Longtime guitarist Jim Martin left the group in 1994 and was replaced by Mr. Bungleguitarist Trey Spruance. After the release of their next album, 1995′s King for a Day… Fool for a Lifetime, Spruance was replaced briefly by Dean Menta, who would eventually be replaced by their current guitarist Jon Hudson. After releasing one more album, Album of the Year, in 1997, Faith No More broke up in April 1998, and all members began work on side projects.On February 24, 2009, Faith No More announced that they would be reforming for a Europan tour with the same lineup at the time of their breakup.In June 2009, they performed together for the first time in eleven years at the Brixton Academy in London, United Kingdom, as part of their The Second Coming Tour. Throughout 2010, the band continued to perform at multiple live venues. In September 2010, the band announced that the reunion tour would come to an end in December and plans for a new album had been scrapped, although bassist Billy Gould has said recently that the band might continue. Faith No More returned again in November 14th 2011 at the SWU Music and Arts Festival, in the Brazilian city of Paulínia, as well on three other dates. Trey Spruance joined the band onstage for the very first time to perform the King for a Day, Fool for a Lifetime album in its entirety in Santiago, Chile in November 2011. On the subject of Midlife crisis, I read an article recently listing The top 40 signs of a modern midlife crisis, as being.. Looking up your medical symptoms on the internet. Always noting when politicians or business leaders are younger than you. Contemplating having a hair transplant or plastic surgery. 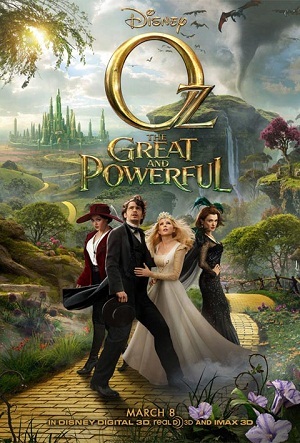 The film Oz the Great and Powerful is out on DVD on Monday 1 July. Directed by Sam Raimi. The film is adapted from L. Frank Baum’s 1900 novel The Wonderful Wizard of Oz, and is a prequel to both the novel and the classic 1939 film The Wizard of Oz, which starred Judy Garland. Set before the events of the 1939 film and original book, Oz the Great and Powerful stars James Franco as a a small-time Kansas circus magician named Oscar Diggs who gets spirited away to the magical land of Oz, and at first he thinks he’s hit the jackpot—fame and fortune are his for the taking… that is until he meets the witches Theodora (Mila Kunis), Evanora (Rachel Weisz), and Glinda (Michelle Williams) who are not convinced he is the great wizard everyone’s been expecting. Diggs soon finds out that the Land of Oz is in turmoil and finds himself drawn into the epic problems facing the Land. Even though he is not the all-powerful saviour the Oz-dwellers think he is, he must put his magical arts to use through illusion, ingenuity, and even a bit of wizardry in order to battle the wicked witches and restore the Magical Land of Oz to its former glory. Having already read the book,I would like to watch the 2012 German epic science fiction drama Cloud Atlas, which is out on DVD on 1 July 2013 stars Tom Hanks and is written, produced and diected by Lana and Andy Wachowski (who wrote the Matrix Trilogy)nd Tom Tykwer and adapted from the 2004 novel by David Mitchel, te filmfeature multiple plotlines set across six different eras.The film was nominated for a Golden Globe Award for Best Original Score for Tykwer (who co-scored the film), Johnny Klimek and Reinhold ei. The film consists of six interrelated and interwoven stories that take the viewer from the South Pacific in the 19th century to a distant, post-apocalyptic future. Unlike th original novel, the film is structured, according to novelist David Mitchell, “as a sort of pointillist mosaic: We stay in each of the six worlds just long enough for the hook to be sunk in, and from then on the film darts from world to world at the speed of a plate-spinner, revisiting each narrative for long enough to propel it forward. The first story is set in the South Paific Ocean, 1849: Adam Ewing, a young American lawyer from San Francisco during the California Gold Rush, has come to the Chatham Islands to conclude a business arrangement with Reverend Gilles Horrox for his father-in-law, Haskell Moore. He witnesses the whipping of a Moriori slave, Autua. Later Ewing ascends a high hill called Conical Tor, covered in jungle with no view. He stumbles on the lip of the crater and is knocked out. He awakes to find himself surrounded by hundreds of faces carved in the bark of trees. Ewig, reasoning that those who carved the faces must have had egress from the crater, manages to escape. Descending Conical Tor again, he resolves not to mention the glyphs outside of his journal. Autua then stows away on Ewing’s ship, and convinces Ewing to advocate for him to join the crew as a freeman. Meanwhile, aboard the ship Ewing sees Doctor Henry Goose, who examines the injuries Ewing sustained on the volcano and his chronic Ailment. The doctor diagnoses it as a fatal parasite, and recommends a course of treatment that might save Ewing but it will certainly make him feel worse before he gets betterDr. Henry Goose slowly poisons Ewing, claiming it to be the cure for a parasitic worm, aiming to steal Ewing’s valuables. When Goose attempts to administer the fatal dose, Autua saves Ewing. Returning to America, Ewing and his wife, Tilda, denounce her father’s complicity in slavery. The second story Letters from Zedelghem (Part 1) is told in the form of letters from Robert Frobisher, a recently disowned and penniless, bisexual young English musician, to his old friend and lover, Rufus Sixsmith. The story starts off in Cambridge then moves to Zedelghem, near Bruges, Belgium, 1931. English musician Robert Sixsmith offer his services as an amanuensis to a famous but reclusive English composer named Vyvyan Ayrs who is dying of syphillis and nearly blind, allowing Frobisher the time and inspiration to compose his own masterpiece, “The Cloud Atlas Sextet”.Along the way he sleeps with the (male) ship’s steward. . Frobisher auditions and gains the grudging acceptance of Ayrs for his services. Ayrs’ wife Jocasta begins to subtly flirt with Frobisher. Ayrs’ daughter Eva, however, smells a rat and takes a posture of unrelenting hostility. Soon, however, Robert and Ayrs bear fruit with the creation of Der Todtenvogel (“The Death Bird”) which is performed nightly in Kraków, where it becomes the talk of the town. Frobisher says he even has begun composing his own music again. Frobisher and Jocasta Ayrs become lovers, but Eva remains suspicious. Frobisher begins taking rare books from Ayrs’ collection and selling them to a fence. One of the books he has found is titled The Pacific Journal of Adam Ewing but it is ripped in half and it drives him crazy, because, as he says, ”A half-read book is a half-finished love affair.” He is amused that the author seems unaware that Dr Goose is poisoning him. One time when Jocasta and Frobisher are sleeping together, Ayrs pounds on his door and demands Frobisher writes down the notes he heard in a dream. Jocasta hides in a lump under the covers, and Ayrs, nearly blind, never sees her there. The dream was about a “nightmarish cafe” deep underground where the waitresses all had the same face and ate soap. When he is done humming his tune, he asks if Jocasta ever made advances to Frobisher, who answers, after some embarrassment, “emphatically, no.” As the summer comes to an end, Jocasta thanks Robert for “giving Vyvyan his music back.” Robert agrees to stay on until next summer at least, as Ayrs asked, time enough to turn his dream music into a major symphony called Eternal Recurrence however it ends in tragedy. The next story An Orison of Sonmi~451 (Part 1)is set in a dystopian futuristic statecalled Neo Seoul in 2144: where , a genetically-engineered fabricant (clone) server at a fast-food restaurant named Sonmi-451, is being interviewed and recounts how she was released from her compliant life of servitude by Hae-Joo Chang, a member of “Union”, an underground rebel movement and learns the truth about Ne So Copros. While in hiding, she watches a movie called Ghastly Ordeal of Timothy Cavendish and is utterly captivated by how it immersed her in a far earlier time. Fabricants, it is revealed, are treated as slave labor by ‘pureblood’ society, who stunt the fabricants’ consciousness through chemical manipulation and stop them becoming self-aware, or “ascended . Sonmi~451 also learns that fabricants like her are “recycled” into food for future fabricants. She decides that the system of society based on slavery and exploitation of fabricants is intolerable, so At the rebels’ encouragement, she writes an abolitionist Declarations that tells the truth about their society and calls for rebellion. She is brought to Hawaii to make a public broadcast of her manifesto, however she is arrested She then reveals that she knows everything that happened to her was in fact instigated by the government, to create an artificial enemy figure to encourage the oppression of fabricants by purebloods. But she believes her Declarations will be inspirational nonetheless. Her last wish before being executed is to finish watching the film she began before…The Ghastly Ordeal of Timothy Cavendish. The next story Sloosha’s Crossin’ an’ Ev’rythin’ After takes place on The Big Island of Hawaii on post-apocalyptic Earth (dated “106 winters after “The Fall”, identified as 2321): Zachry lives with his sister and young niece Catkin in a primitive society called “The Valley” after most of humanity has died during a cataclysmic event referred to as “The Fall”; the Valley tribesmen worship Sonmi as a goddess. but are often raided by the violent cannibalistic Kona tribe from the other side of the island. Zachry’s village is also occasionally visited by Meronym, a member of the technologically sophisticated“Prescients”, a society holding on to remnants of technology from before the Fall. However Zachry is suspicious of Meronym until she saves Catkin when she is poisoned by a Stonefish. In exchange for saving Catkin , Zachry agrees to guide Meronym into the mountains to the top of Mauna Kea volcano, a place the villagers fear because of the mysterious temples on its summit, and go in search of the Cloud Atlas, a communications station where she is able to send a message to people who have left Earth and now live on other planets. At the station, Meronym says that Sonmi was a human and not a goddess as the Valley tribes believe. , they go with most of the valleysfolk to trade at Honokaa. But first Honokaa, then the valley, is invaded by Kona tribesmen who enslave the villagers. Zachry and Meronym eventually escape , Zachry kills the Kona Chief and rescues Catkin, but they are attacked by more Kona warriors and have to be rescued by Meronym.and she takes him to a safer island.